Raglan Castle is a magnificant example of a late medieval castle and has been a popular destination for travellers to the Wye Valley for hundreds of years. Built as much for display as for defence, the castle provided eighteenth century tourists with a glimpse of how they thought a medieval castle should look. 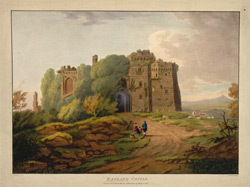 William Coxe, a clergyman who visited Raglan in c.1801 enthused over the 'majestic ruins' and the ' fine prospect of an extensive tract of country, bounded by the distant hills and mountains' which could be viewed from the remaining tower'. He considered the grand entrance to be the most magnificant part of the ruins with its gothic portal, flanked by two massive tower beautifully tufted with ivy. He also like the 'machicolated summit' of the towers ' presenting a highly picturesque appearance'.